Everyone’s diabetes journey is different. The way you live your life with diabetes today versus 10 years from now is inevitably going to feel and look very different. Where you currently are in your journey will also affect how much of your life with diabetes you choose to share with other people. I was diagnosed with type 1 diabetes in December 1997 when I was 19 years old. When diagnosed I didn’t understand how much it was going to impact my entire life. I didn’t know anyone else living with diabetes, and I knew nothing about the condition. I was not in denial. I was not ashamed. I diligently measured my blood sugar and took my insulin, but I never really talked about it. My close friends knew I had diabetes, but it was never discussed. In fact, it required some convincing from the ones who loved me to even mention it at my workplace. I was living in what I call the “Diabetes Closet.” I lived like this for the first 15 years of my life with diabetes. Always thinking that it was my burden to bear — not realizing how much I could gain from connecting and learning from others living with diabetes and how much others could gain from connecting with me. I simply didn’t know what I was missing by living in the Diabetes Closet. I thought doing things by myself, alone, would be optimal, but now I know how very wrong I was. The major change for me was when I started to exercise a lot and realized that I needed help on how to manage exercise, food, and diabetes. I looked online, and I talked to my medical team, but no one was able to give me usable guidance or advice. So, once again I was alone, and I started my own quest in trying to figure everything out. 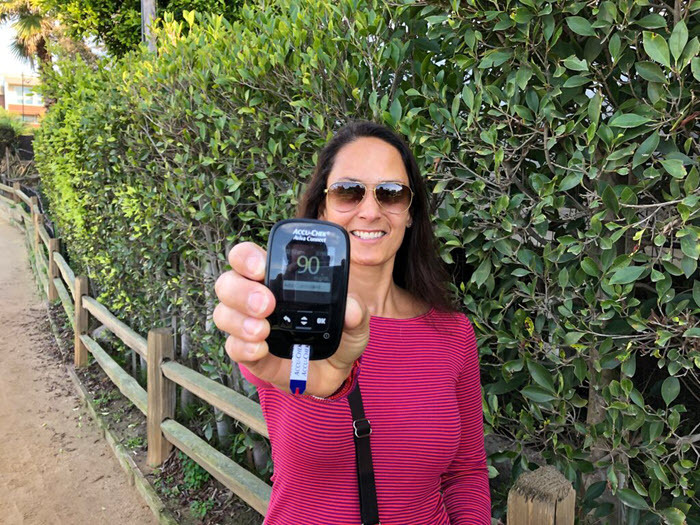 At the same time, I began to document my research, my trial and error around nutrition and exercise — everything and anything I could regarding my personal diabetes education. I shared all of this online, and that is how my website DiabetesStrong.com came to be. To my surprise a lot of other people living with diabetes found my website. They, too, were struggling to get useful guidance on real life diabetes management around nutrition and exercise. That is when I realized that my diabetes experience could be helpful to others and when the world of the Diabetes Online Community (DOC) opened up to me. Suddenly I was connecting with people living with diabetes from all over the world, finding support and an entire community I didn’t even know I was missing. I decided, at that point, to completely jump out of that Diabetes Closet. I realized that not only do I have something to offer others living with diabetes, but the diabetes community also had so much to offer me. Even when I was private about my diabetes, I still measured my blood sugar and injected insulin in public. But I did it extremely discretely, keeping my glucose meter in my lap under the table cloth, and administering injections under the table, too. And people didn’t notice. My diabetes gear was just simply never on the table when I went out. It was never really public. That all changed when I began wearing a CGM (continuous glucose monitor). Inevitably, your diabetes is now visible to everyone around you — depending of course, on where you place your sensors. The best location for my sensors seems to be on my upper arm. Since I live in California and wear short sleeves almost year around, this meant that I was essentially displaying a diabetes device 24/7. Fortunately, this was around the time I came out of the Diabetes Closet. Looking back, things might have been different — especially emotionally — had I not been in that phase of my diabetes journey. I was a little self-conscious when first wearing my CGM, but during that same first day 3 other people living with diabetes came up to me to introduce themselves. By wearing a CGM that was visible to everyone around me, it enabled me to instantly and effortlessly connect with others — many of whom had never met another person living with diabetes. This was such a powerful experience for me that I decided to make wearing and showing off my diabetes gear a consistent part of my life. It is simply now a part of who I am. Thanks to wearing my CGM visibly on my arm, people without diabetes often come up to me and point to it, asking politely what it is. While this might have embarrassed me in the past, I now see it as an opportunity to educate others about what it means to live with diabetes. I also have days where I don’t feel like talking about my diabetes, and I think that is OK. No one should feel forced to talk about their diabetes, especially with strangers. On those days I wear a long-sleeved shirt. Or if asked about my CGM, I’ll simply answer that it’s a medical device and then go on with my day. Being vocal about my diabetes, showing it off by wearing and managing my diabetes in public, and engaging more actively in the diabetes community has been a true blessing for me. Meeting others living with diabetes online or in person means that I now know people all over the world who “get it.” If I’m battling morning highs, crazy spikes, finally nailed that basal rate, or feel fed up with the demands of this disease, I know I am not alone and there is always someone who will listen. There are several ways to connect with others living with diabetes through social media and in person. My favorite social media platform is Instagram (you can find me @diabetesstrong_ig), but the community is also strong on Facebook and Twitter. To connect with others in person, I also look to my local network. In the US, Beyond Type 1, Diabetes Sisters, and Meetup are good ways to find others living with diabetes. Outside the US, I would look to your local diabetes organization to see if they arrange meetups, and if they don’t, you can try searching your favorite social media channel (Facebook, Twitter, Instagram, etc.) for people living in your area. There are so many of us out there, and the beauty of social media is that even if you live in a remote area, you can still connect with others around the world who know firsthand what living with diabetes is like. I’ve found the diabetes community to be strong and very inclusive, regardless of what type of diabetes you live with, and regardless of where you live. You just have to step out of that Diabetes Closet and reach out.